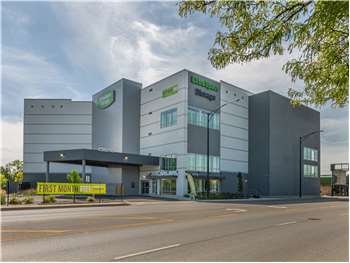 Located on N McCormick Blvd between W Devon Ave and N Lincoln Ave, Extra Space Storage serves Chicago residents near North Park, Pulaski Park, Lincolnwood, West Ridge, Little India, Arcadia Terrace, and more. Locals will recognize our facility across from The Home Depot. Are you a college student who needs affordable self storage in Chicago? Extra Space Storage is about 1.3 miles from Northeastern Illinois University, 1.5 miles from North Park University, and 3.4 miles from Loyola University, so we're an excellent option for summer storage or storage while studying abroad. With a wide selection of storage units, climate-controlled storage, heated storage, and exceptional security, Extra Space Storage on N McCormick Blvd is your go-to storage partner in North Park, Chicago! Our N McCormick Blvd storage facility offers unit sizes as small as 25 square feet and as large as 300+ square feet with convenient features like indoor access, first-floor access, and elevator access. With advanced security features like electronic gate access, security access to your floor only, and 24-hour video surveillance at our Chicago storage facility, you can store valuable items with peace of mind. Keep delicate items safe year-round with climate control or heated storage at Extra Space Storage in North Park. Climate-controlled units stay between 55 and 80 degrees at all times, while heated units ensure your storage space stays warm when the temperature outside starts dropping. Not only does Extra Space Storage maintain a clean, secure facility at all times, but we also have the best customer service in the industry! Our friendly, professional staff goes the extra mile to ensure you're satisfied with your self storage experience. Contact us today to reserve a storage unit in Chicago!